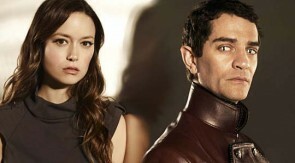 Buddytv Interview with Summer Glau and James Frain. They talked about Orwell's secrets and Chess' motivations -- and they answered some of the questions the fans wanted to ask. Summer Glau says that she is happy to be playing a TV character who has normal human emotions. New Access video interview with Summer Glau and David Lyons at the 2011 NBC Winter TCAs about the fan response they have gotten to "The Cape." Another chat with Summer Glau and James Frain. Summer says : "Vince might see Orwell as his Girl Friday, but in Orwell’s eyes, she’s allowing Vince into her fight against her cause. She’s really guarded and in control . But she’s also more lonely and vulnerable than she’d like to admit, and we’ll see in the future what it does to her when she admits what he means to her and their common fight."